Thunderbolt began at Intel Labs with a simple concept, create an incredibly fast input/output technology that just about anything can plug into. After close technical collaboration between Intel and Apple, Thunderbolt emerged from the lab to make its appearance in Mac computers. Intel co-invented USB and PCI Express, which have become widely adopted technologies for data transfer. Apple invented FireWire and was instrumental in popularizing USB. Their collective experience has made Thunderbolt the most powerful, most flexible I/O technology ever in a personal computer. Thunderbolt (originally codenamed Light Peak) is an interface for connecting peripheral devices to a computer via an expansion bus. Thunderbolt was developed by Intel and brought to market with technical collaboration from Apple Inc. It was introduced commercially on Apple's updated MacBook Pro line up on February 24, 2011, using the same port and connector as Mini display Port. Though initially registered with Apple Inc., full rights of the Thunderbolt technology trademark belong to Intel Corp., and subsequently led to the transfer of the registration. Thunderbolt essentially combines PCI Express and Display Port into a new serial data interface that can be carried over longer and less costly cables. Because PCI Express is widely supported by device vendors and built into most of Intel's modern chipsets, Thunderbolt can be added to existing products with relative ease. Thunderbolt driver chips fold the data from these two sources together, and split them back apart again for consumption within the devices. This makes the system backward compatible with existing Display Port hardware upstream of the driver. The interface was originally intended to run on an optical physical layer using components and flexible optical fiber cabling developed by Intel partners and at Intel's Silicon Photonics lab. The Intel technology at the time was marketed under the name Light Peak, today (2011) referred to as Silicon Photonics Link. However, conventional copper wiring turned out to be able to furnish the desired 10 Gbit/s Thunderbolt bandwidth per channel at lower cost. Later versions of Thunderbolt are still planned to introduce an optical physical layer based on Intel silicon photonics technology. Data transfers for backup, sharing, and editing are faster with Thunderbolt technology, significantly reducing times to complete these tasks. For time-sensitive data, such as video and audio during creation and playback, data transfers can be critical to the success of the work. Thunderbolt technology was specifically designed with video and audio applications in mind with inherently low latency and highly accurate time synchronization capabilities. As every generation of information technology progresses, I/O technologies evolve to provide higher bandwidth for getting data into and out of computers. At its simplest, two discrete types of I/O have resulted – display (with formatted video and audio components), and data. Traditional approaches to this evolution have been to make an Existing technology faster. Thunderbolt technology combines the next step in higher performance with the innovation of mapping two of the most fundamental I/O protocols at the heart of computing (PCI Express and DisplayPort), onto a single highly efficient meta protocol, transmitting them over a single cable, and managing the traffic routing (supporting daisy chaining and hot-plugging devices) with intelligent hardware controllers. The choice of PCI Express was clear, providing for off-the-shelf controller use to attach to nearly any technology imaginable, and the choice of DisplayPort was equally clear for meeting the needs of the PC industry with capabilities like support for greater-than-high definition display resolutions, and support for up to 8 channels of high-definition audio. Thunderbolt technology is based on switched fabric architecture with full-duplex links. Unlike bus-based I/O architectures, each Thunderbolt port on a computer is capable of providing the full bandwidth of the link in both directions with no sharing of bandwidth between ports or between upstream and downstream directions. 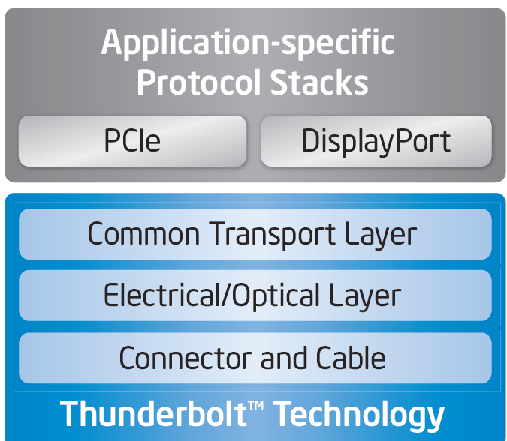 The Thunderbolt protocol architecture can be abstracted into four layers as shown in Figure. A Thunderbolt connector is capable of providing two full-duplex channels. Each channel provides bi-directional 10 Gbps of bandwidth. A Thunderbolt connector on a computer is capable of Connecting with a cable to Thunderbolt products or to DisplayPort devices. The Thunderbolt connector is extremely small, making it ideal for thin systems and compact cables. Compatibility with DisplayPort devices is provided by an interoperability mode between host devices and DisplayPort products; if a DisplayPort device is detected, a Thunderbolt controller will drive compatibility mode DisplayPort signals to that device. Thunderbolt cables may be electrical or optical; both use the same Thunderbolt connector. An active electrical-only cable provides for connections of up to 3 meters in length, and provides for up to 10W of power deliverable to a bus-powered device. And an active optical cable provides for much greater lengths; tens of meters. The Thunderbolt protocol physical layer is responsible for link maintenance including hot-plug detection, and data encoding to provide highly efficient data transfer. The physical layer has been designed to introduce very minimal overhead and provides full 10Gbps of usable bandwidth to the upper layers. A highly efficient, low-overhead packet format with flexible QoS support that allows multiplexing of bursty PCI Express transactions with isochronous Display Port communication on the same link. A novel time synchronization protocol that allows all the Thunderbolt products connected in a domain to synchronize their time within 8ns of each other. Display Port and PCI Express protocols are mapped onto the transport layer. The mapping function is provided by a protocol adapter which is responsible for efficient encapsulation of the mapped protocol information into transport layer packets. Mapped protocol packets between a source device and a destination device may be routed over a path that may cross multiple Thunderbolt controllers. At the destination device, a protocol adapter recreates the mapped protocol in a way that is indistinguishable from what was received by the source device. The main focus of Thunderbolt comes on two layers, Physical layer and Transport layer. The Thunderbolt protocol physical layer is responsible for link maintenance including hot-plug detection, and data encoding to provide highly efficient data transfer. The physical layer has been designed to introduce very minimal overhead and provides full 10Gbps of usable bandwidth to the upper layers. Hot-plugging means, plugin a peripheral or another computer to a computer while the machine is hot, while the machine is working, Physical layer is actually responsible for that.